Meghan Markle her ex-Cory Vitiello makes a big announcement!! - ViralDoozy Your source for Celebrity gossip, latest Entertainment news and Viral stories. 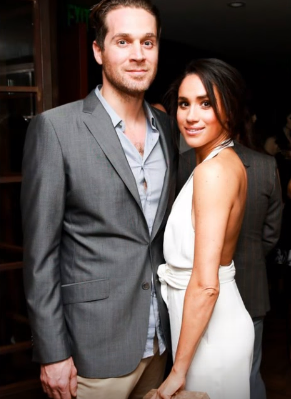 Home Celebrity Buzz Meghan Markle her ex-Cory Vitiello makes a big announcement!! Meghan Markle her ex-Cory Vitiello makes a big announcement!! After meeting Prince Harry's ex in Amsterdam, Meghan Markle has to face her past. In fact, her ex-Cory Vitiello, after she separated from him in 2016, he made a big announcement on social networks. Meghan Markle and Harry are definitely being stalked by their exes! A couple of days ago, when the two lovebirds were enjoying a romantic trip to Amsterdam, they came face-to-face with Jenna Coleman, Prince Harry's ex. An embarrassing moment for Lady Di's son, who would have preferred to delete this idyll from his memory. Indeed, if he has maintained a good relationship with his former companions Chelsy Davy was even invited to his wedding - not the case with the 32-year-old actress. Cory Vitiello has become a father! But after the Duke of Sussex, it was Meghan Markle's turn to face her past. While she learned a few months ago of her ex-Trevor Engelson's engagement with Tracey Kurland, it was this time the cook Cory Vitiello who made a big statement. Separated from Meghan Markle in 2016 - after two years of the relationship - he has just become a father! His partner, Martina Sorbara, gave birth to a lovely little boy on October 2. Enough to put some pressure on Meghan Markle. Because from her end, the duchess has still not given Prince Harry any descendants! Married for only five months, the two lovers are nevertheless the subject of many rumors. When Meghan Markle appeared with a slightly rounded belly at a charity event, the bookmakers are sure that she's pregnant! After George, Charlotte, and Louis, should Queen Elizabeth II expect the fourth great-grandchild?